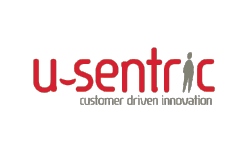 U-SENTRIC is a young, dynamic company, founded end 2007 and born out of the Centre of User Experience (CUO) of the K;U;Leuven – Belgium. Its core competence is Human Centered Design. U-SENTRIC already builded a solid reputation within the market and serves many clients within various sectors going from finance, energy, governments, pharma, health and this for several projects/development processes from digital devices, product devices and services.